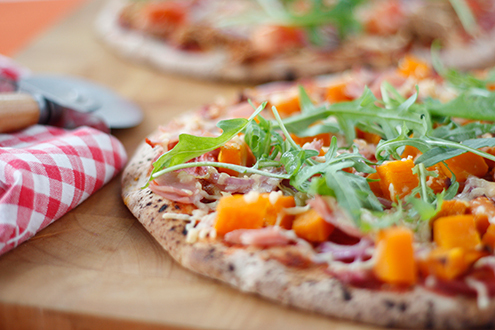 How delicious does this gestational diabetes friendly Homemade Pizza look? Tell me something. After looking through the recipes here at GestationalDiabetesRecipes, are you surprised at the variety of meals that you can still eat even with gestational diabetes? Help build your own confidence around meal planning. It can really pay off taking a few minutes each day to practice reviewing any recipe you come across, on or offline, to develop a feel for what adjustments would be needed to make it gestational diabetes friendly. In most cases it will be the amount of carbs or fat. And then add on some fresh vegetables for an all round increase in fibre and nutrients. Heat oven to 180C/ 350F. To build pizzas: Place pizza bases onto ovenproof trays. Mix tomato paste, dried herbs and light olive oil in a small bowl. Spoon enough into the centre of each pizza base to thinly cover it. Add your choice of toppings and place in oven for 10 minutes until cheese is bubbling. ** Heat oven to 180C/ 350F. Peel 100-120g/ 4 ounces pumpkin and cut into small cubes. Place on an ovenproof tray or dish and lightly spray with light olive oil or cooking oil. Roast for around 15 minutes until pumpkin is tender.